I'm usually quite aware of new health food trend and ingredients so it's been a longtime coming for me to finally get acquainted with amaranth. Amaranth is an ancient seed, similar to quinoa but nuttier and crunchier in texture. It is a very high source of protein which aids in digestion and helps develop healthy bones. It has a number of preparations which I am excited to explore more of in both savoury and sweet applications. 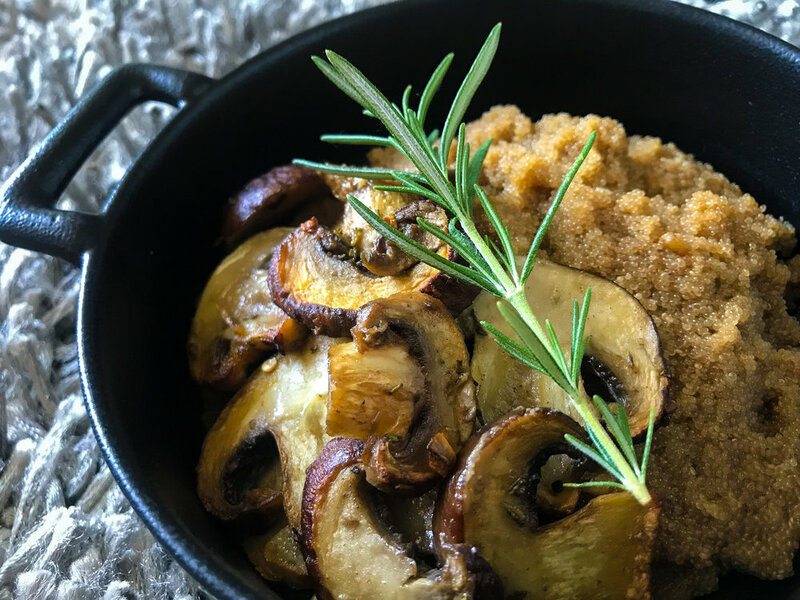 But for my first time playing around with amaranth, I decided to keep it hearty with a rosemary garlic mushroom and amaranth polenta recipe. This recipe was such a gamble. I had taken a risk by creating this recipe on my #SIAintheKithen live video on Instagram and I am so happy with how flavourful and tasty it turned out! I knew the mushrooms would be a big hit based on the ingredients alone but I was so unsure about how the polenta would turn out. The cooking ratio for amaranth is 1:2. I was skeptical because even after 25 minutes of active cook time on the stove, there was still a bit of liquid leftover. Don't be concerned - once you add the cheese in, it thickens up quite nicely. It is good to note that it is not nearly as creamy as a traditional polenta and I would recommend eating this straight away. The amaranth polenta makes for a nice bed for hearty proteins. I can imagine this being a great side dish to a steak or lamb loin. For this recipe, it paired perfectly the the rosemary garlic mushrooms. Cremini mushrooms are incredibly meaty and a great vegetarian option for a main. To make the amaranth polenta, bring the vegetable broth up to a boil in a small pot. Once that is boiling, add the amaranth and turn the heat down to low for it to simmer. Cover and let cook covered for about 25 - 30 minutes or until it is cooked. It is still quite nutty and crunchy when fully cooked. Gradually add the cheese in and stir. Add salt and pepper to taste. Set aside. While your amaranth polenta is cooking, preheat your oven to 400F and place your rack in the middle. Line a baking sheet with aluminum foil, Silpat or parchment paper and set aside. Make the dressing - add all the ingredients from garlic to the salt and pepper and mix until well combined.